There are some general unspoken rules of etiquette when you plan on hunkering down at Starbucks, like buying a drink if you&apos;re planning on working there or not blasting music on your speakers. But, how about making Starbucks your own personal office? A couple of weeks ago, I spotted a man in a hoodie just before 9 a.m. at the Starbucks on Hollywood and Western. I had to do a double-take because he took up a whole table with his entire computer setup, with a huge monitor, keyboards and equipment sitting in USPS boxes. There was bubble-wrap everywhere. There appeared to be another monitor wrapped in a protective sheet, sitting on another chair he commandeered as part of his new home office. My thought was that he just really needed to hack, like a character out of the so-bad-it&apos;s-good 1995 movie Hackers. While I&apos;ve seen some people take up an entire table to themselves, this was overdoing it to say the least. I had so many questions. Did he get kicked out of his apartment? Was this part of a Nathan Fielder prank? 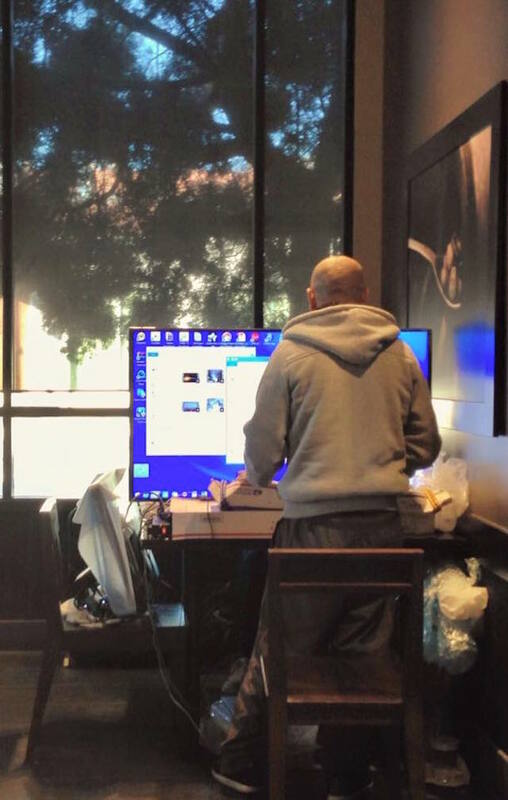 However, yesterday user dmizz posted on Reddit a photo a friend took of the same guy at a Starbucks in Los Feliz on Monday. 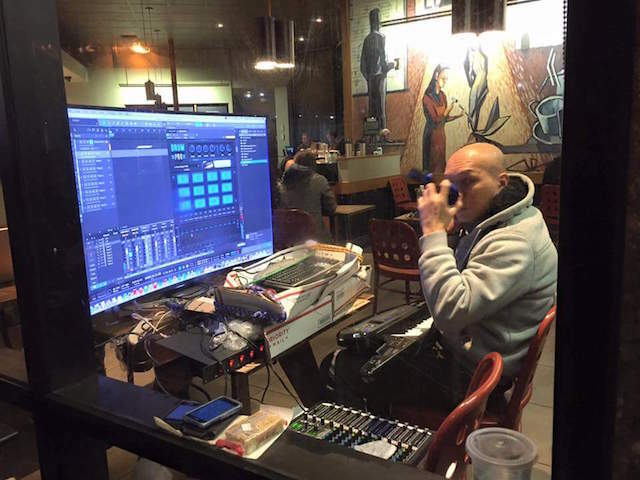 Terence Deutsch, who took the photo and describes himself as "just a sound designer that was in the right place at the right time," told LAist he saw the man on Monday at the coffee shop on Vermont and Prospect avenues. He quickly snapped a photo of the man with his setup from a window outside and quickly scampered away after the man noticed. A closer look at the photo shows that the mystery man was working on audio/music software. Setting up your office at Starbucks might be a growing trend. "I was at the same location a few days earlier for the same reason and at that time noticed about 2-4 people with fairly elaborate mobile viewing setups (Blu-ray players packed in luggage bags, monitors hard-wired to suitcases, etc. )," Deutsch says. "I don&apos;t know what it is about that location." About the man with his whole computer setup, user innajunglestyle wrote on Reddit, "It&apos;s kind of dickish but I also sort of admire his chutzpah." SAME. EZ_does_it expressed what was on all of our minds though: "I&apos;d be sooo paranoid to go to the bathroom and leave that un attended [sic]."